We love to share the beauty of the ocean with people all around the world. 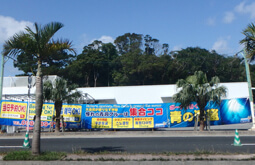 Marine club UMI is one of the largest marine leisure shops in Okinawa. 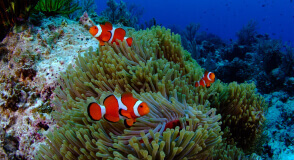 Specialized in scuba diving and snorkeling. Our shop is located in the middle of the island, on main road 58. 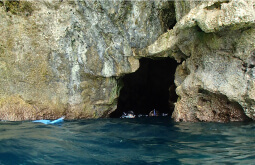 The famous “blue cave” is just five minutes’ drive from our shop. We offer tours in Japanese, Chinese, English and Korean. 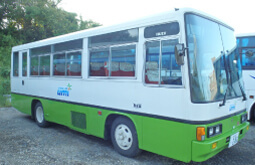 We can accommodate wide range of customers from kids to seniors and also family trips and school trips. 1 person to more than 100 people at given time slot. Our professional and friendly staff will make sure our tours are FUN and SAFE. The shop is located near Ryukyu Mura and on the opposite side of gas station ENEOS. The shop is along Route 58 so you can find it easily. We have a large scale parking lot which is free. It takes only 5 minutes from our shop to the entry point. You will wear a wetsuit, marine boots and life jacket. Wetsuit is necessary to protect you from dangerous creatures and buoyancy. There are many sizes for kids and adults. You can use locker and changing room. It takes only 5 minutes to Cape Maeda and the port by car. We have a microbus for transportation. If you choose beach plan, you go to Cape Maeda. If you choose boat plan, you go to a port nearby. 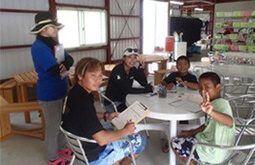 When you arrive to Cape Maeda or port, your guide gives a briefing about tour and how to use equipment. Explain how to breathe underwater and equalize. Firstly, let’s take pictures. Beach plan, you go down a long stairs to get into the water. Please keep right and watch your steps. For diving, at shallow area you will practice breathing and equalizing. 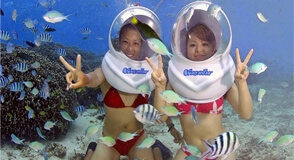 For snorkeling, your guide will help you to put on your mask and fins. Boat plan, during 7 minutes boat ride, your guide will help you to put on the equipment. You will practice the skill at shallow area near the boat. 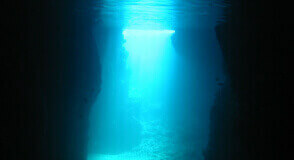 ⑦ Let’s swim to Blue cave now! Once you master these skills, we will start swimming toward the blue cave. 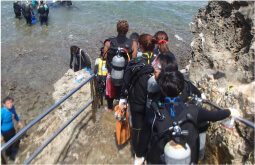 For snorkeling, your guide will help you to put on your mask and fins. Once you are comfortable with equipment, we will slowly start to swim. Our instructors support you so you can keep going steadily. You will see cute fish on the way. ⑧ Finally! the “mysterious” Blue cave. After few minutes of swim, you will arrive at the blue cave. Please keep close to your instructor because it’s little bit dark inside of Blue cave. Once you get used to the darkness, you will see a deep blue world you have never seen before. We are sure that you will be impressed and have great memories. Your guide will help you to take beautiful pictures. You can boast it on SNS. ＊We rent water camera as option. Please apply at the reception in advance. 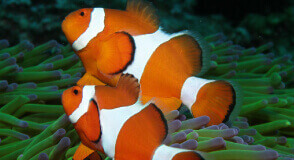 There are many tropical fishes near blue cave. After the mysterious blue cave, you can enjoy feeding fish. They will come very close to you. Here, you can make really impressing memories as well. Go back to the point of entry. By any chance if you feel sick, please let us know as soon as possible. Once you come back the shop, you can take hot shower and change clothes in a changing room. If you register our SNS, we give you a present. Make sure that you take everything before leaving the shop. Blue cave is a rare cave where you can get to easily. 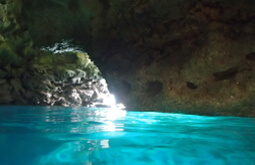 Blue cave is located in Cape Maeda in Onna village. The visibility is very high and there are a lot of tropical fish. There are 2 ways to get to Blue cave. Beach plan, you go down a long stairs to get into the water. Please keep right and watch your steps. Distance from the entry point to blue cave is 100 meters. You take a boat at a port and entry into water from shallows nearby. It takes 5 minutes from the entry point to Blue cave. ・　Person older than 60 without a medical certification. ・　Person who has heart disease, diabetes, high blood pressure and the nose and ears disease. ・　Person who is hung over or still drunk. ・　If you don’t accept our instruction, we may refuse your entry even amid tours.